Sometimes in life, there are blessings you have to just be patient and wait for. You know, those things you want so badly and then you finally get them. Our third child was that way for me. We had 2 wonderful, healthy kids but I just knew we were not done. The husband on the other hand, well it took more like 6 years to convince. By the time he said yes, my heart was exploding with joy. When our sweet Garner Reese joined our lives, we were all (the big kids included) just beside ourselves. She was so perfect and amazing! I honestly can’t believe it has now been 2 years since she arrived! She has kept us laughing and smiling every day for these last 2 years. She is truly a joy. She talks our ears off, has the wildest imagination, and really does say the funniest things. Her facial expressions are sometimes just too much. She is smart- yes I know, everyone thinks their kid is smart, so I am just one of those moms! She loves pink, babies, shoes (especially her pink cowgirl boots), chocolate, playing with her big brother and sister, and puppies. In the week leading up to her birthday, I asked her “Garner what do you want for your birthday?” she yells “CAKE” Well, that is easy enough right!? I said “oh ok, just cake!” and she said “ummmm….. pink cake…… with sparkles” Really? 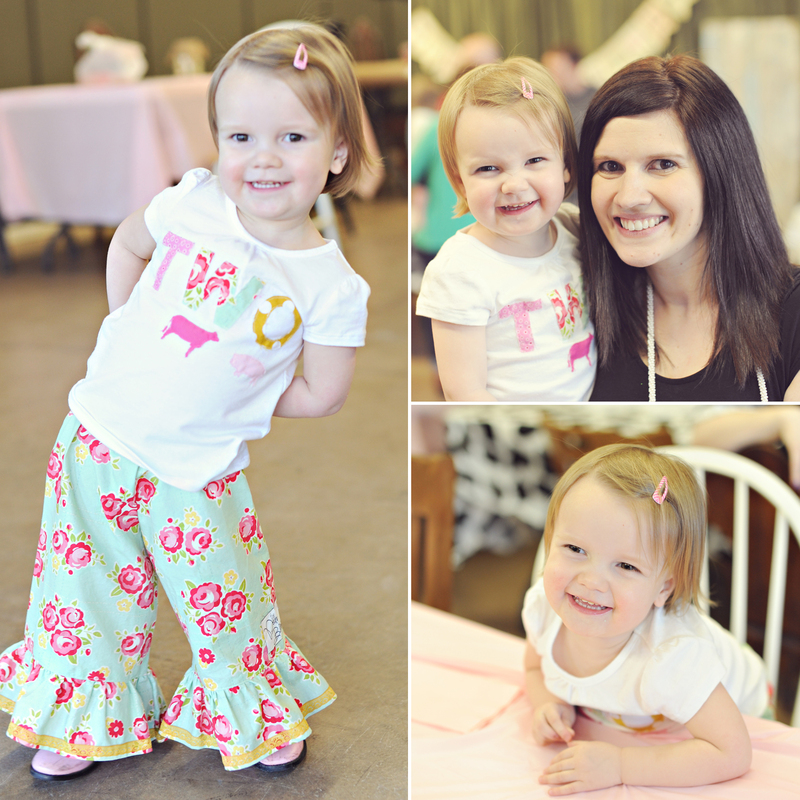 This little lady who is a few weeks shy of turning two just requested pink, sparkly cake? Well ok then! I had already planned the party. I had decided to go “Simple and cheap” Well, if you know me, simple doesn’t usually work for me, even when I try. I was going to make a few simple decorations and bake some cupcakes myself. The invite list was a little long….. So, it ended up being bigger then I planned, and I spent way more time and money on it then I would have liked. The day of the party, we had some unexpected bumps and all the things I had planned didn’t happen, BUT, she had a blast and that is what matters, right!?!? Here are the details. 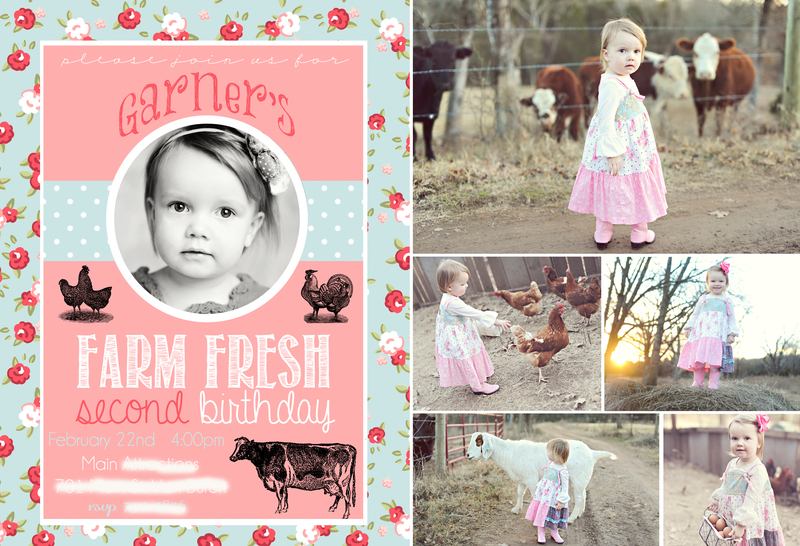 We decided to go with a Farm Fresh theme. She LOVES our farm animals and that her daddy takes her to see them all. She kind of loves her daddy.a little.tiny.bit. Farm animals don’t always do what you ask them to, so the photo shoot for the invitations was not what I had hoped, but they turned out adorable any way. 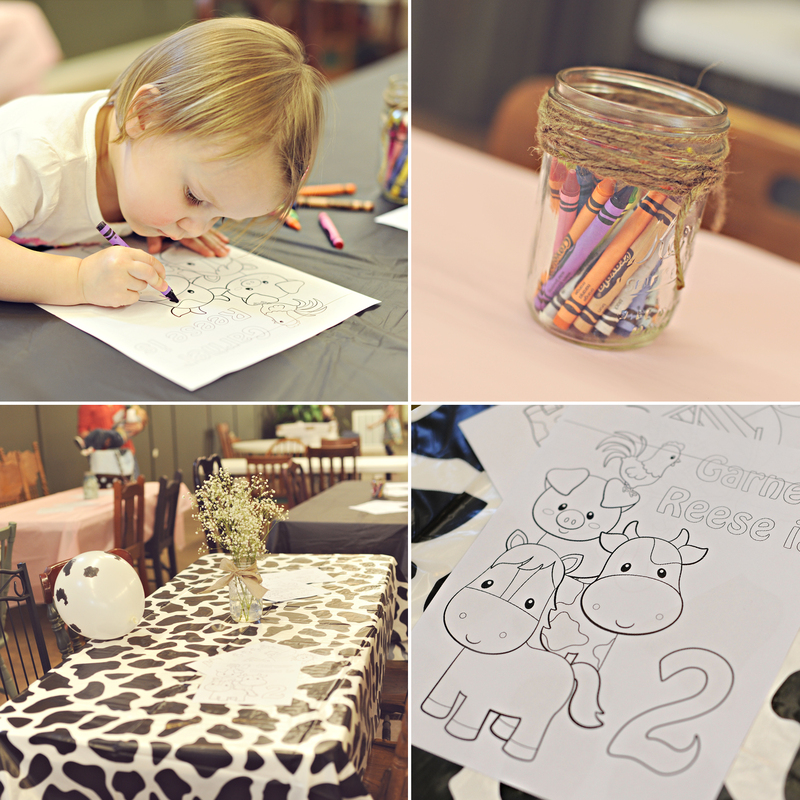 We decided to rent a location for the party because weather is unpredictable this time of year and we weren’t sure if we would be able to do an outside farm animal party. We basically had one big room with tables and chairs and plenty of room for the kids to run and play. The cupcakes (my crazy self made a little over 100 of these….. yes I am nuts and I will not ever attempt that again!) They are not perfect but they tasted pretty good so I guess was a win. AND, The icing was pink, with sparkles so Garner was happy! 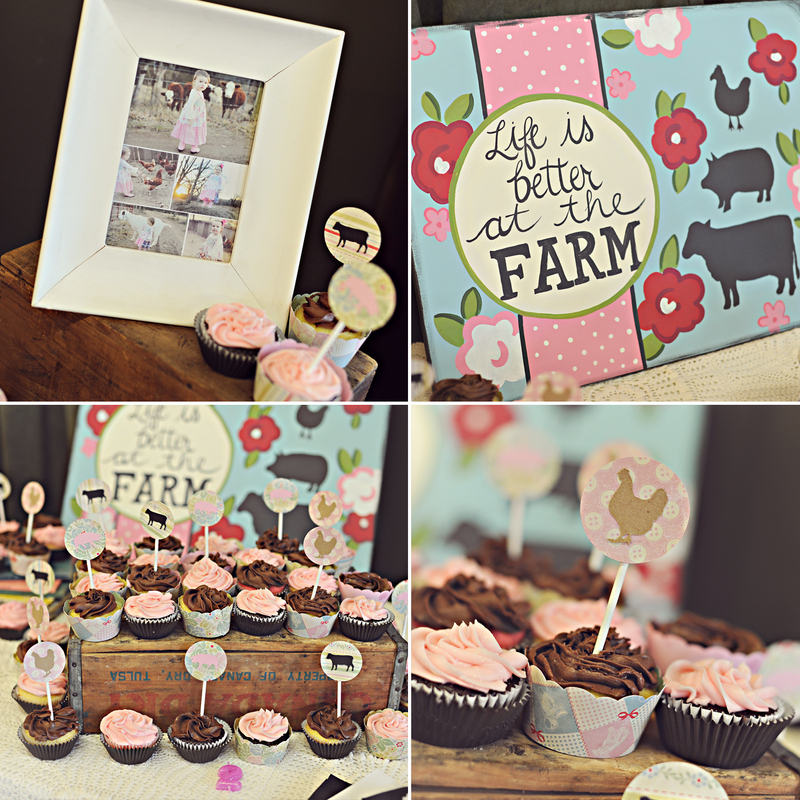 I just brought crates to stack the cupcakes on, a framed invitation, an adorable sign I painted/helped paint at Cross My Art, and a lace table cloth. I used a fancy paper cutter to make the cupcake toppers and cupcake wrappers. 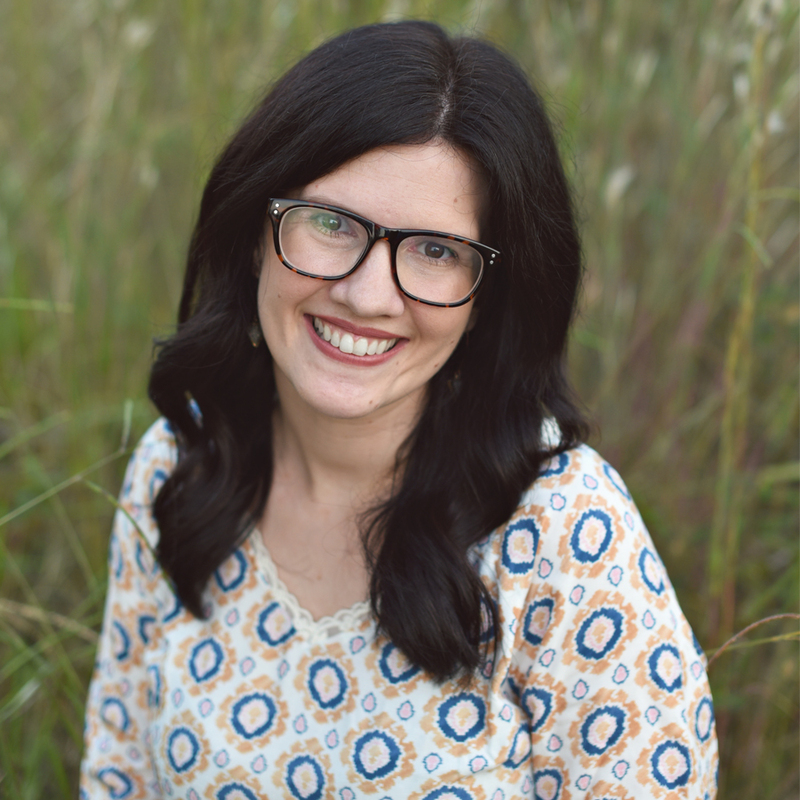 Luckily, my good friend The Cookbook Queen has all kinds of helpful things, like the fancy paper cutter I can borrow, sparkle for the cupcakes, AND amazing recipes for frosting! Garner was not so sure about everyone singing to her. 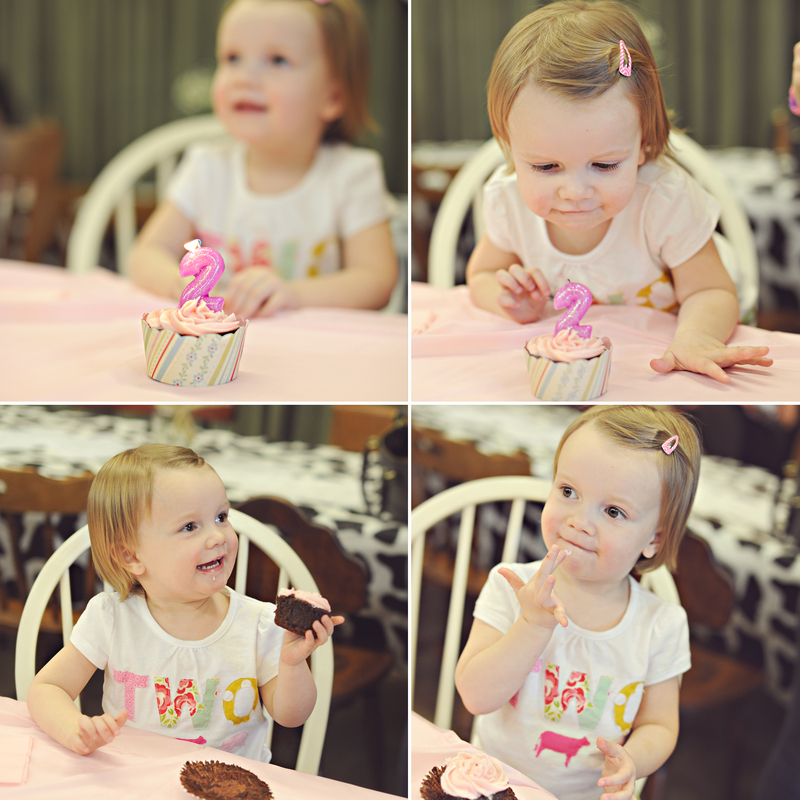 She kind of just looked a little nervous, but then blew that candle out and started enjoying that pink sparkly cupcake she had been waiting on so patiently. 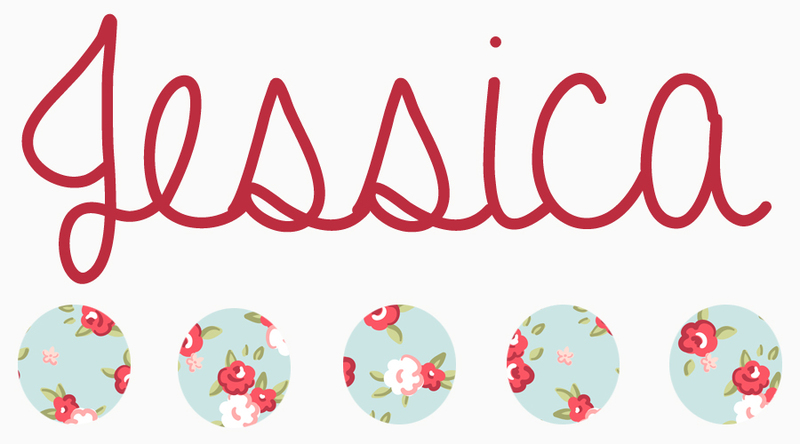 I also used the fancy paper cutter for this banner. The lighting in this room is terrible, but you get the idea. 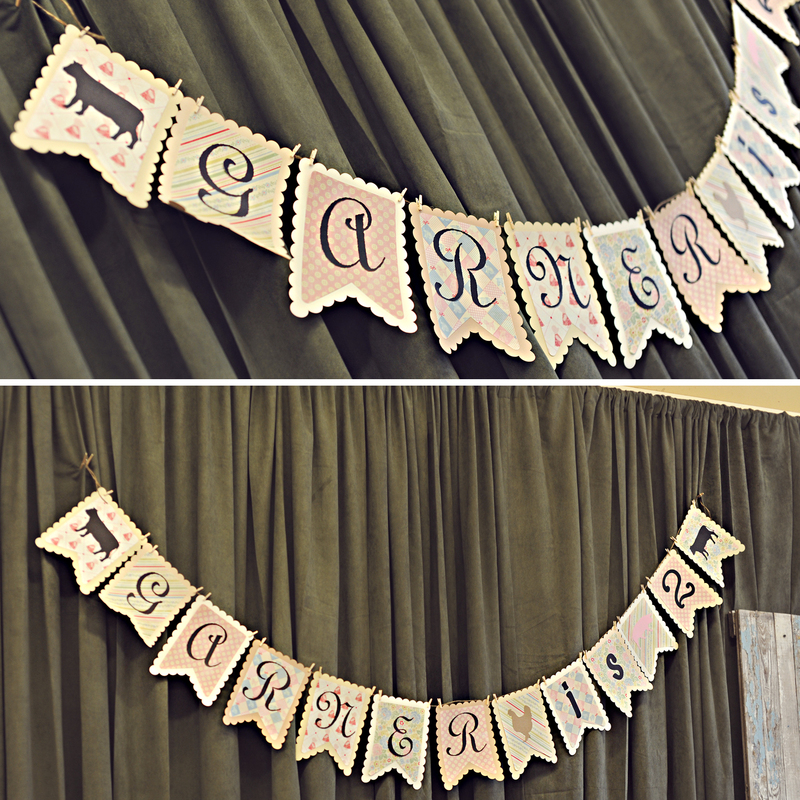 I used some vintage looking papers on the banner. So what did we do for entertainment? Oh My list was long- but then I got tired and gave up. I ended up with two planned activities, which were both so simple but I figured I was trying to appeal to 2 year olds, so it was ok. The first one I had seen on pinterest. 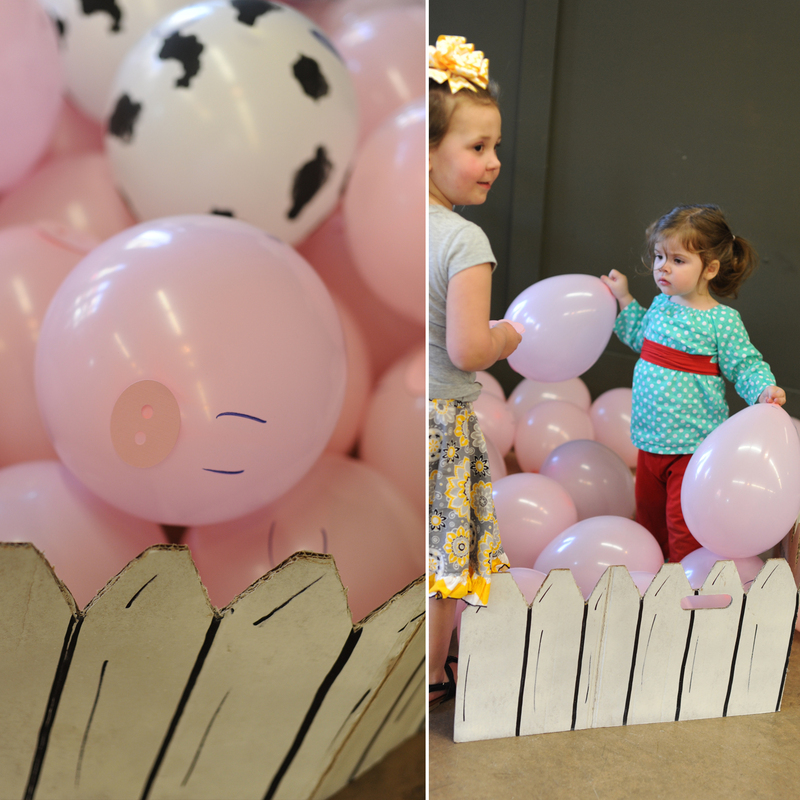 Basically you blow up balloons, and make them look like pigs. We did this very simply by cutting out snouts and drawing eyes and a tail on with a sharpie. Then you put them all in the “pig pen”. The idea is that we scatter the pigs and the kids have to hurry and get them back in the pen. 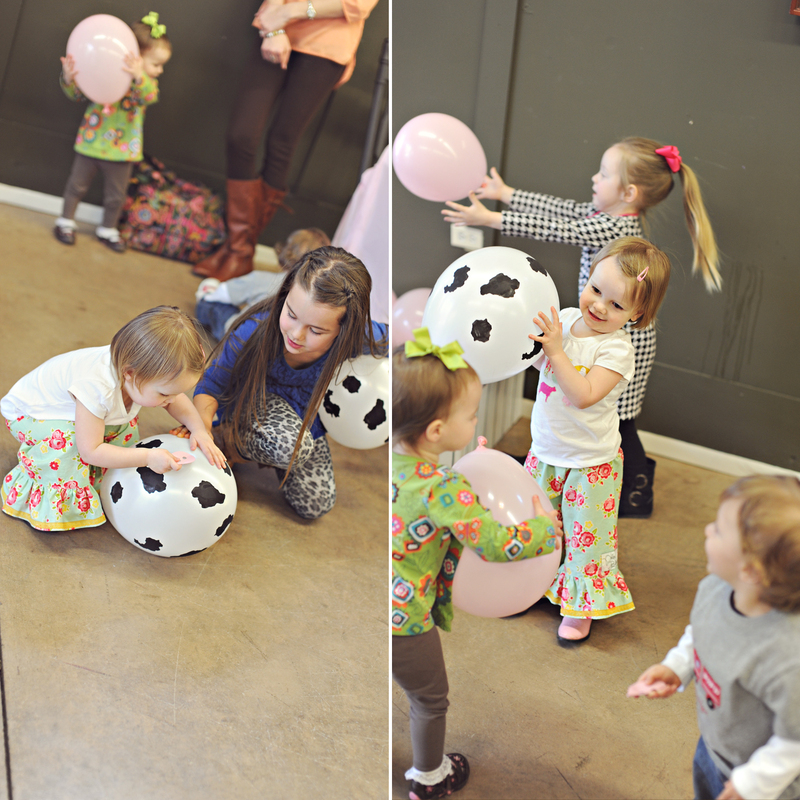 BUT, the kids had so much fun with the balloons before we played the game, that we never played the game. Oh well! The other activity was custom coloring sheets that I purchased off etsy. The kids seemed to love them too. I paid $5 for 4 and ordered them from this shop. Garner had so much fun with everyone. She smiled non stop! She is still talking about her birthday party! My sweet friend made Garner’s birthday outfit for me and it looked so cute on her! I am just so thankful for this precious gift! She is truly a blessing to us!